Birthday Tradition…or what we ate for breakfast today. Yup. Your eyes are not deceiving you. This is what is sitting in my digestive system right this second and the digestive system of each of my precious little people…even my twenty-month-old. Why would I ever feed my children this food (and I use the term loosely here)? Because today is my six-year-old’s birthday and this is our Birthday Tradition. Each morning, I feed my children a nutritious, whole-foods meal. In the winter, we mostly eat a hot cereal of organic, whole-grains. In the summer, we eat more homemade granola, fruit salads, yogurt, etc. Both seasons, we have eggs and toast sometimes, too. 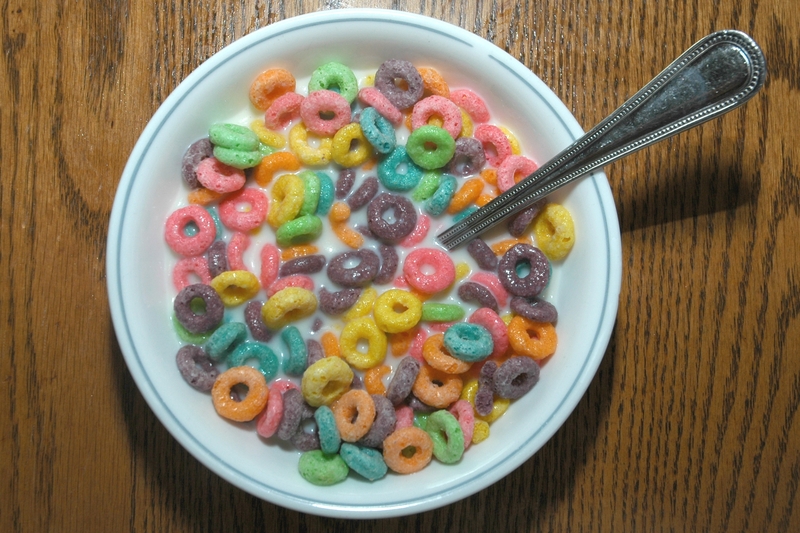 I rarely buy any kind of cold cereal, as I find them to be highly processed and really not all that nutritious, despite the claims on their labels. As a child, I was sometimes jealous of the other kids who would talk about eating Captain Crunch or Golden Grahams for breakfast, knowing my mom would never in a million years buy any of these cereals. Our kids have had a lot of fun getting to try out these normally completely taboo foods. I have to admit, it has been a lot of fun for me, too. However, it is also a humbling experience to run into acquaintances at the grocery store with a huge box of Froot Loops in your basket.